The Holy Martyr George the New was born into an illustrious Bulgarian family, living in the capital city of Bulgaria – Sredets (now the city of Sofia). Saint George was implored of the Lord by the fervent prayer of his parents, John and Mary, who until their declining years remained childless. They baptised the infant in the name of the holy GreatMartyr George (Comm. 23 April). Young George received a fine upbringing, he attentively studied the Holy Scriptures, and he was pious and chaste. His parents died when George reached age 25. At that time Bulgaria found itself under the rule of the Turks, who by force converted Christians to Mahometanism. Once several musselmans tried to convert George. They put on the head of the saint a tafta (fez), a circular headpiece, in which musselmans enter their own house of prayer. But George threw the fez (tafta) on the ground. The turks with beatings and abuse led the martyr to their governor. The governor was impressed with the manly form and handsome face of Saint George and he began gently to urge him to accept Mahometanism, promising dignitary honours and wealth from Sultan Selim (1512-1520). But the saint boldly and steadfastly confessed his faith in the Lord Jesus Christ and reproached the error of Mahometanism. The governor in a rage gave orders to incessantly flog Saint George with canes, but the saint bravely endured in his confession of faith in Christ. The governor gave orders to intensify the tortures. The passion-bearer enduringly bore all his sufferings, calling for help on the Lord Jesus Christ. They then led the martyr through the city to the beat of a drum and shouts: "Do not insult Mahomet nor abase the musselman faith". Finally, amidst the city a big bon-fire was fired up, for burning Saint George, but he, – weakened from his wounds, fell upon the ground. They threw him still alive into the fire, and from above they threw on corpses of dogs, so that then Christians would not then be able to find the remains of the martyr. But suddenly heavy rain started pouring and extinguished the bon-fire. With the onset of evening darkness, the place, – where the body of the martyr was thrown, shone with a bright light. They gave permission to a certain Christian priest to take the venerable remains of the martyr for burial. Informed about the occurrence, Metropolitan Jeremiah with accompanying clergy set out to the place of execution. 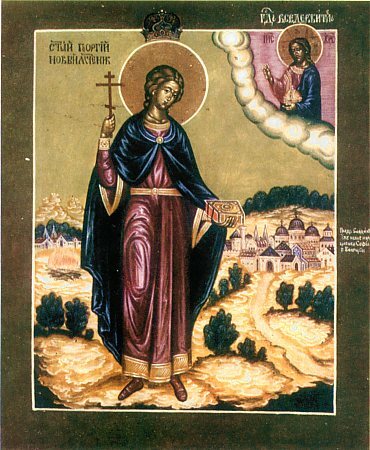 In the extinguished bon-fire they located the body of the holy Martyr George and carried it to the church of the holy GreatMartyr George in the city of Sredets.